Soy milk is made from soybeans, which are soaked, finely ground, and then strained, and the fluid obtained is called soy milk. Consuming soy milk regularly lowers cholesterol, fights against prostate cancer and breast cancer, calms hot flashes, helps in weight loss, and prevents osteoporosis. The importance of nutrition in one’s diet has been highlighted both by the healthcare experts and the media. In the light of this, the significance of soy products has gained importance lately. Research has been performed to understand the health benefits of soy milk. Soy milk is made from soybeans, which are soaked, finely ground, and then strained, and the fluid obtained is called soy milk. Soy milk is also consumed as an alternative drink to cow's milk due to its health benefits. There is high quality protein content present in the milk. It can be consumed by vegans and people who are lactose intolerant too. 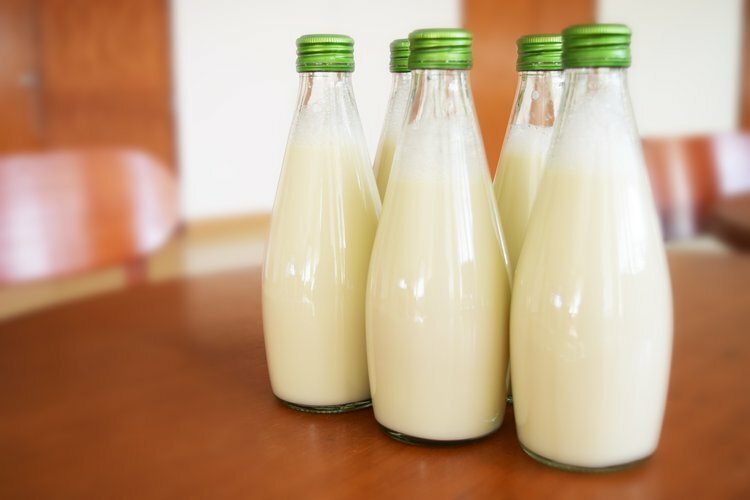 Consuming soy milk regularly lowers cholesterol, fights against prostate cancer and breast cancer, calms hot flashes, helps in weight loss, and prevents osteoporosis. Also, as we age, memory and thinking capacity declines slowly. The prevention of age-related diseases may be possible by drinking soy milk. The primary dietary sources of soy milk are isoflavones, which belong to the phytoestrogen class. Soy products are rich in isoflavones. These nonsteroidal phytoestrogens have good protective effects against a number of chronic and age-related diseases. Isoflavones are chemicals that mimic the hormone estrogen. They either reduce or strengthen the effects of estrogen in the body. Osteoporosis affects mainly postmenopausal women and is also one of the most common medical conditions prevalent in the Unites States. Soy milk, apart from being rich in proteins, it is also rich in vitamin D and calcium, thereby aiding in bone health. By making use of soy milk in the diet, osteoporosis can be minimized in postmenopausal women. When women experience a decline in their estrogen levels, the isoflavones enhance the estrogen levels. Soy provides a boost to the estrogenic effect in women who are past menopause and helps in reducing the severity and frequency of hot flashes, mood swings, and vaginal dryness. Studies also suggest that using soy milk also reduces the risk of heart disease. It lowers the LDL cholesterol in the body. It was found that people with high cholesterol levels had a reduction in their total cholesterol by 9% after the consumption of 31-47 grams of soy protein as a substitute to meat in their everyday meal. Estrogen stimulates the multiplication and growth of cancer cells in the breast. The action of blocking estrogen is carried out by phytoestrogens, which can prevent the multiplication of breast cancer cells. Hence, the risk of breast cancer can be reduced to a great extent by the use of soy-based products. Soy milk is proven to be loaded with health benefits. Start your day by using soy milk in your cereal or oatmeal. Substitute cow's milk with soy milk whenever possible. You could also make a milkshake or a smoothie by masking its flavor, if you particularly dislike its flavor. Some individuals are found to be allergic to soy products. Some medications interact with soy products, too. Therefore, it would be wise to consult a nutrition expert before you start incorporating soy milk into your diet. Rivas, M., Garay, R. P., Escanero, J. F., Cia, P., & Alda, J. O. (2002). Soy milk lowers blood pressure in men and women with mild to moderate essential hypertension. The Journal of nutrition, 132(7), 1900-1902. Zhu, C., Zhai, J., & Dong, S. (2012). Bifunctional fluorescent carbon nanodots: green synthesis via soy milk and application as metal-free electrocatalysts for oxygen reduction. Chemical communications, 48(75), 9367-9369. AL, K., & Oladimeji, G. R. (2008). Production and quality evaluation of soy-corn milk. Journal of Applied Biosciences, 1(2), 40-45.